The original Punt line junction was situated a little further north of the later one that crossed the David Low Bridge. It ran down to the western punt wharf, where they crossed by punt to the east side. The track is believed to have then run easterly to join the Finland Road line. Top Left: Surviving bridge supports over a creek on the mill side of the Maroochy River (see the aerial shot at top of this page). Top Right: The formation is still clearly visible in both directs from the creek. The top image shows towards the Maroochy River as seen in the black and white images below. The lower image is looking back towards Bli Bli. Below: The view south over the David Low Bridge that replaced the original Punt line. Special thanks to Clayton Wilks for use of his outstanding images. 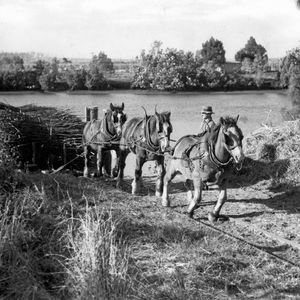 Article on horses working the punt wharf. Copyright Sunshine Coast Daily. Photos: West side of Maroochy River. 1-3-2018 Taken By Zane Hackney.